I thought about it for a few weeks, then plotted out a diagram for this tractor. 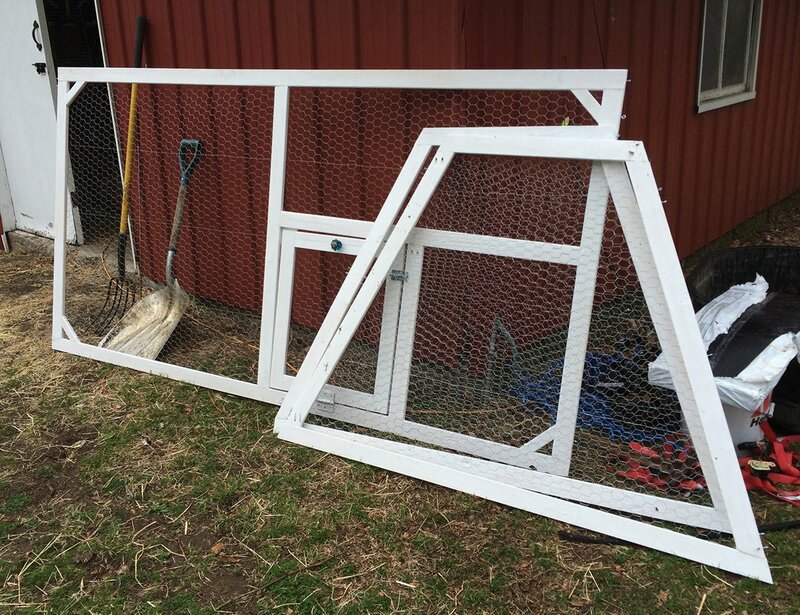 A frame tractors are pretty common, but this modified design allowed for a significantly larger footprint with less weight than a standard A frame, in order to accommodate more chickens comfortably. 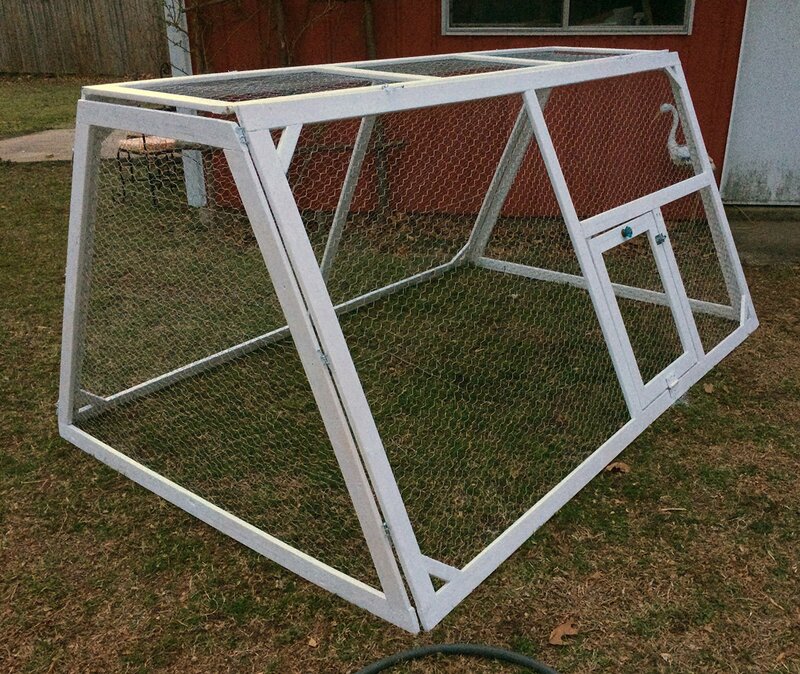 The most unique element of my design is that each side of the chicken tractor is constructed as an independent panel that pins together using a nail or hitch pin and 3 small screw eyes. This keeps the design lightweight and means it can be stored flat. I selected 1×3 furring strips rather than slightly heavier 1×3 dimensional lumber to keep the weight and also construction costs down. 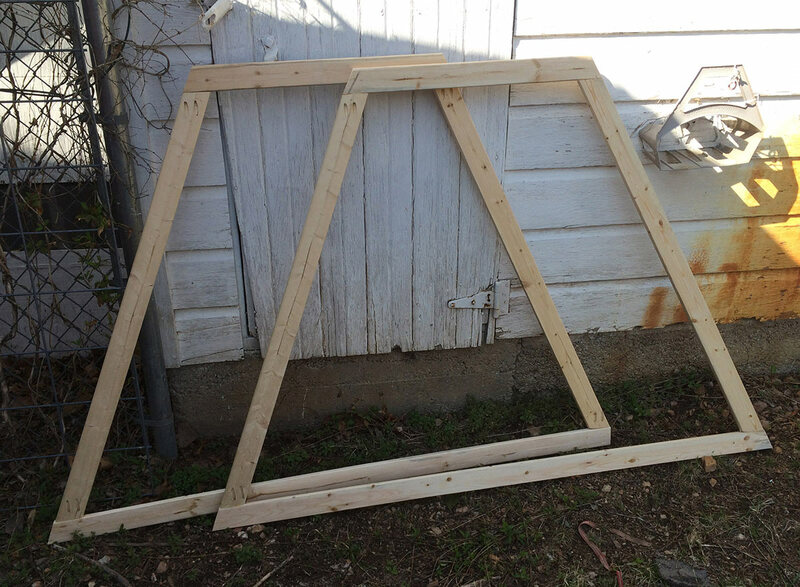 With about $40-45 in lumber, I first created two 4’x8′ rectangle frames with braced corners, and then created a top rectangle piece that was 2’x8′, and two trapezoid end pieces that had 4′ sides, 5′ bottoms, and 2′ tops. Turns out, a small army of trash cans makes a great substitute for a second work table! – This panel had boards added to support the small drop down door. 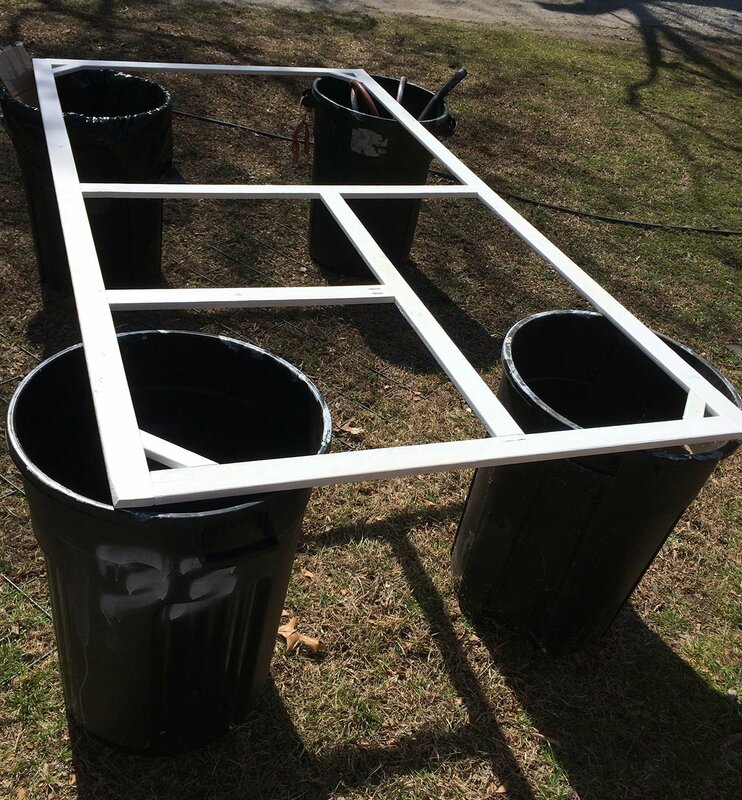 Particularly because I used low grade lumber, I very carefully painted each panel. Pressure treated lumber would have removed this step, but would have likely doubled the weight of the tractor, so I took the time to paint with a high quality exterior paint that would protect the wood from damage by the elements. Want to know my secret for painting boards, posts, and poles quickly? 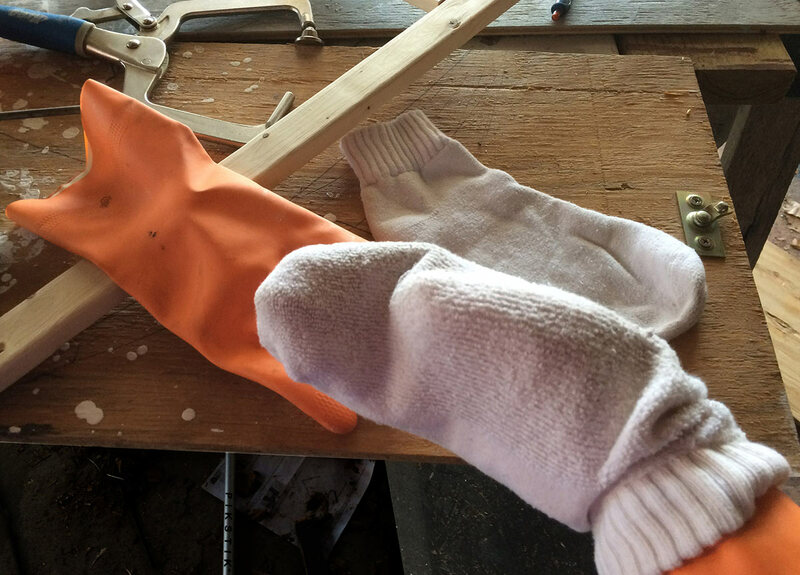 Just put on a rubber glove, then cover the glove with an inside-out athletic sock. Dip your sock-globe in paint and paint away- this diy paint glove makes painting corners, edges, and round surfaces very, very quick! Once painted, I installed dozens of small screw eyes along each of the board edges where they would meet other boards when assembled. 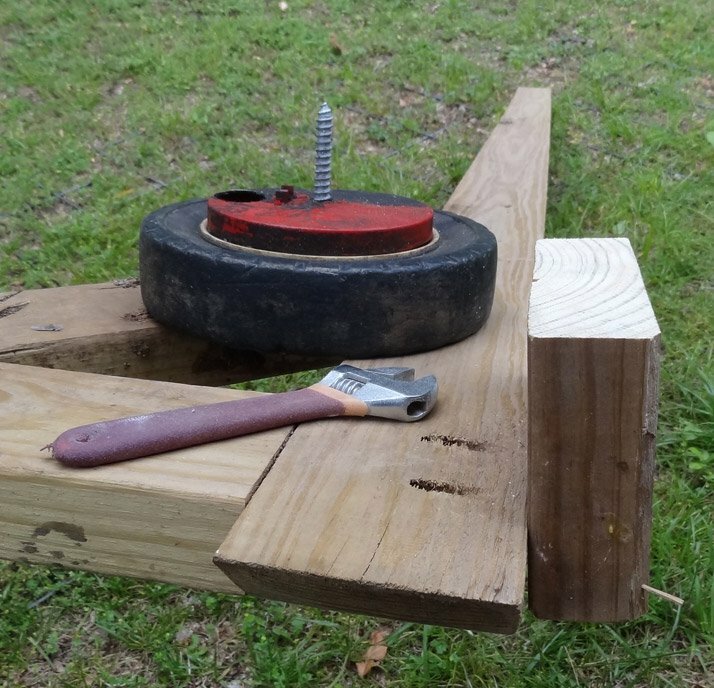 Initially I planned to use hitch pins to hold the tractor panels together, however I found that thick, 3′ galvanized roofing nails actually worked better because their circumference was closer to the circumference of the interior of the screw eyes, resulting in a more stable connection. 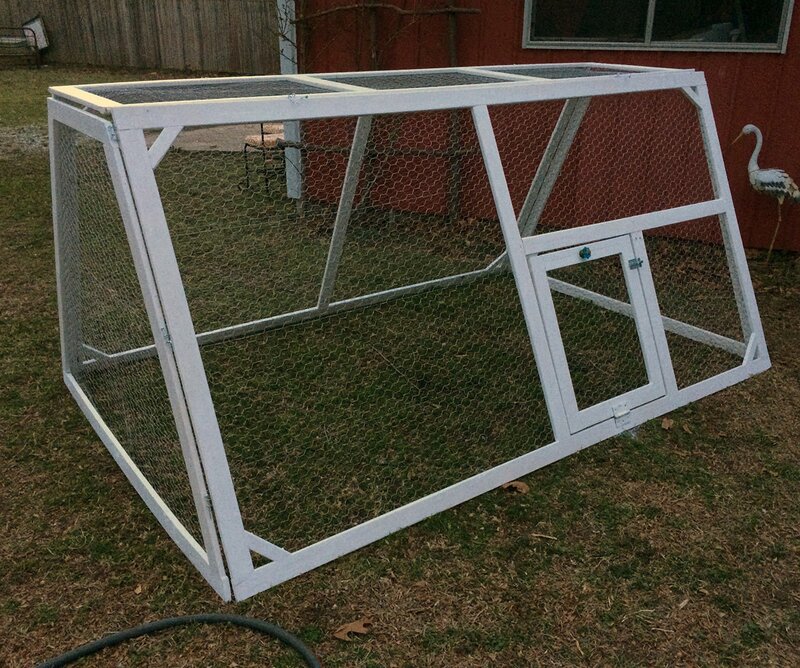 The last step was adding chicken wire to each of the panels. A tedious job, at least having an electric staple gun made it easy. For a bit of class, I finished by adding a colbalt-blue glass anthropologie knob to the door. Chicken wire and screw eyes added, ready to assemble! The finished product required about 5-6 hours of work. This project came together as I worked, and it soon became clear the tractor would require help sliding easily along the ground. 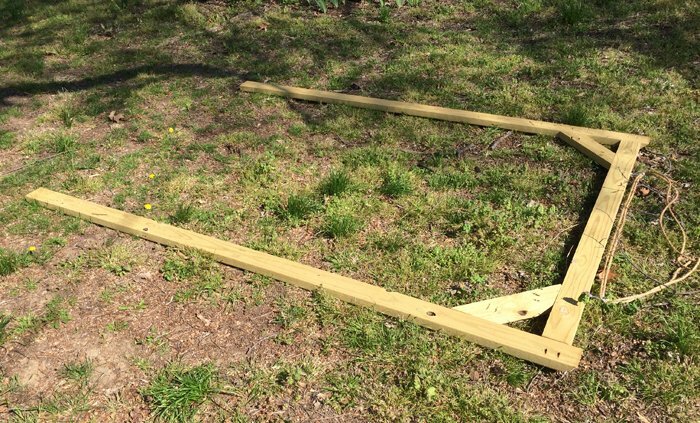 Using 3 pressure treated 2×4 boards, I constructed a basic frame, with leading corners cut at an angle to make dragging easier. I added a brace to each corner, using my kreg jig, to help support the shape. Ultimately, the tractor was “pretty easy” to move by myself, but did require some effort. After my chickens were butchered and the tractor was put away for the season, I did add wheels to the front end of the sled. Luckily the Habitat for Humanity ReStore in Joplin always keeps a tub of wheels salvaged from push-lawnmowers so finding big, durable wheels at a great price was a cinch. I did not closely track expenses on this project, as so many of the supplies I already had on hand. 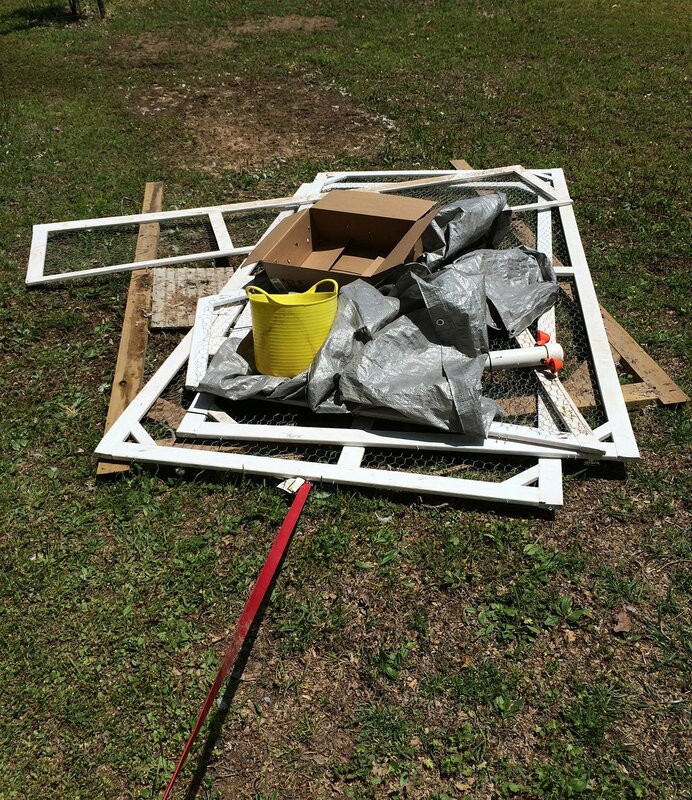 I estimate that I used about $60-$80 worth of lumber (including the sled), $30 worth of chicken wire, and another $10 of miscellaneous hardware, for a total cost of about $100. Hopefully being able to store the panels high and dry in the barn each year will mean this tractor will be usable for many batches of meat chickens in the future. 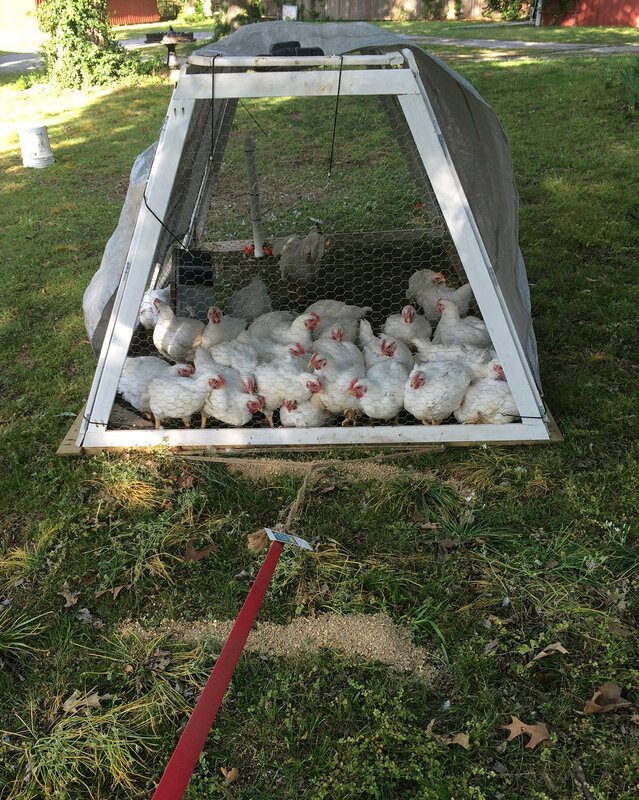 A slightly reflective grey tarp helped keep the chickens cool as the days began to warm up. 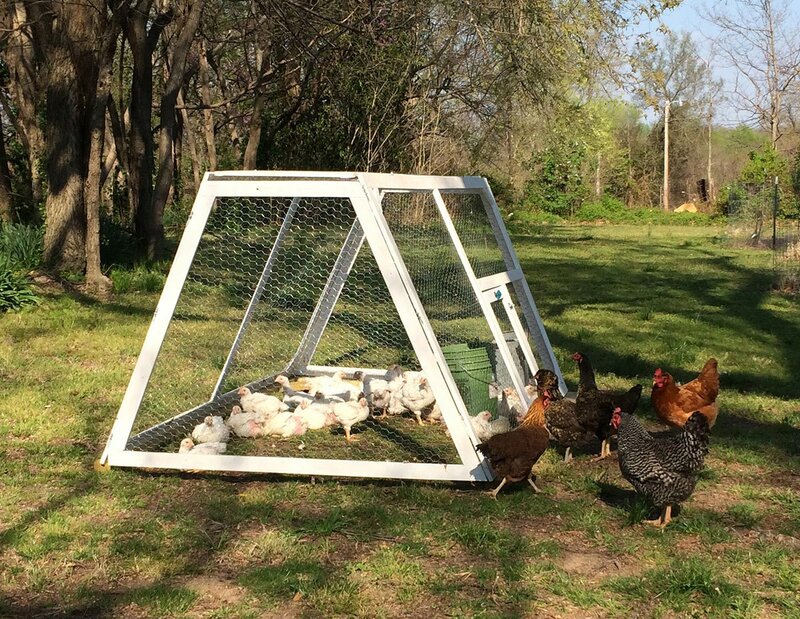 My biggest frustration raising birds in this coop was that I had not planned how to move the food and water with the tractor, so each move meant removing and then adding back the feeder and water-er. I’ve since added a partial floor to the front of the tractor, which will provide a platform to place a feeder and water-er. I was concerned how I’d convince my birds to move with the tractor. 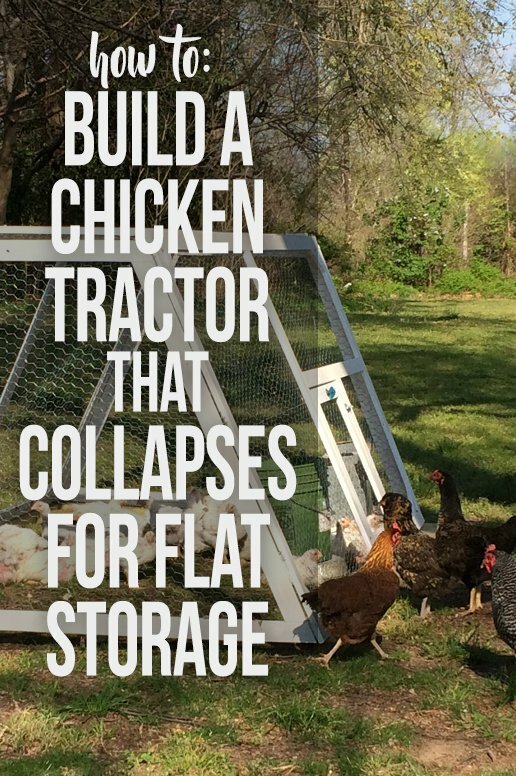 It turns out, letting them run out of food overnight, then sprinkling feed in the space where I wanted to move the tractor made the chickens eager to move with the tractor. 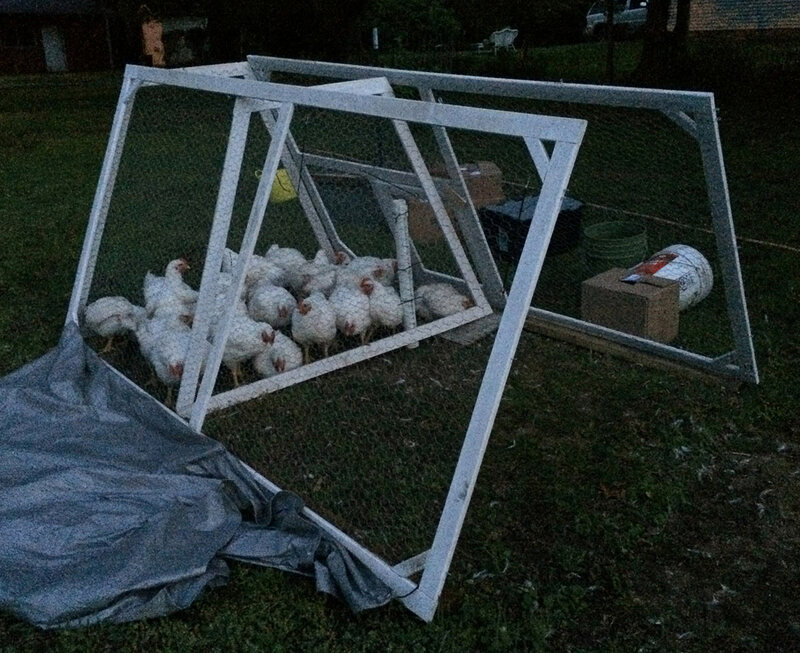 5 am on butchering day: Detaching the panels and using them to compress the chickens into a progressively smaller space made catching the birds easy! What are the angles of the end pieces? Love this design. I will check my angles for you! The nice thing about this tractor is that you can increase the floor space, without increasing the size of the side or top panels, by decreasing the angles and making the height shorter. I’d love to see a picture showing the wheels you added. I am old and don’t have the strength to move it on my hilly land by just dragging it. I love this! 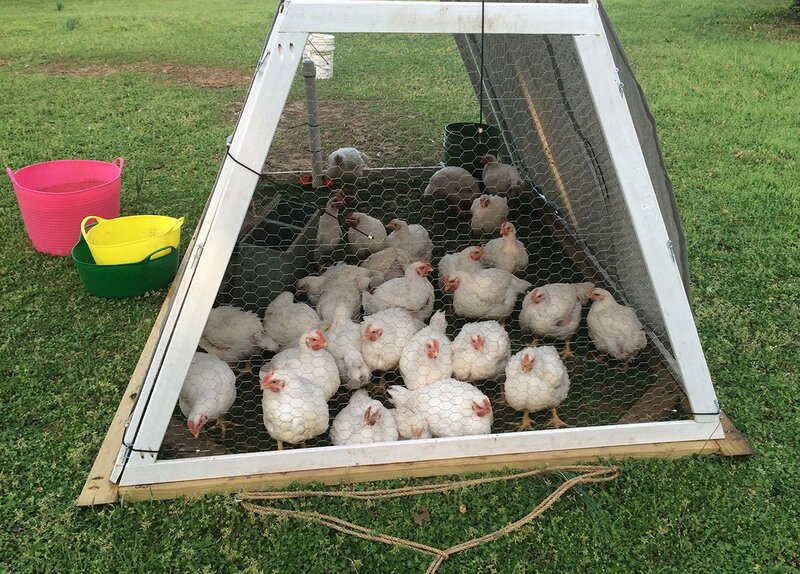 My kids are doing meat chickens for 4-H and this is just what we need! Could you tell me the measurements you used? Thank you. I wish I could but I sold this tractor on to new owners a year or two ago! 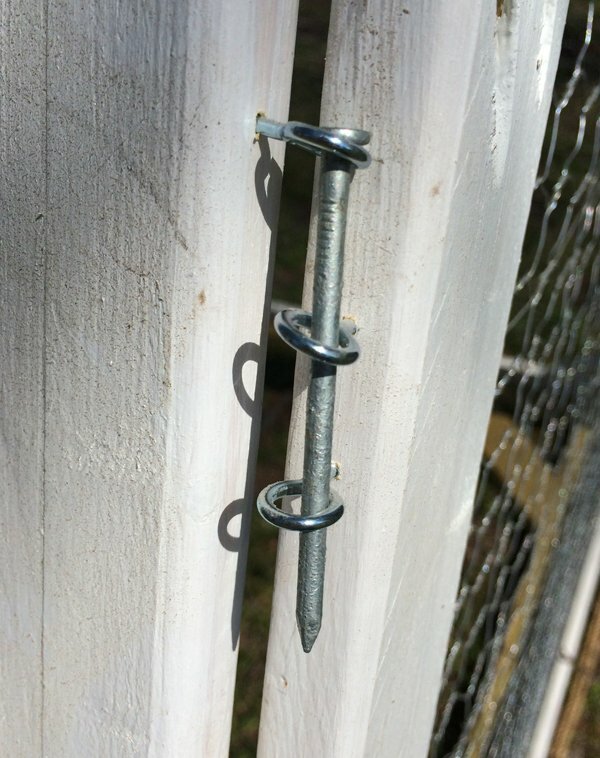 For those furring strips, do you remember what size Kreg screws you used? Any advice for making it work on wood that thin? I just got my Kreg jig, and I think I’m inclined to agree with you on its utility. Also, what a brilliant trick that gloved sock painting thing is!